An upper air low in the north Atlantic has slowly been gaining convection over the past couple of days. NHC appropriately named this system a subtropical storm earlier today. Officially top sustained winds are at 60 mph. This may be a bit high, but not far off. An upper high to the east near the Azores will steer Laura generally northward, then start to move northeast as an upper air trough approaches from the west. Laura is becoming more tropical and may make the transition later today or tonight. It will pass east of Newfoundland then head toward the British Isles in a few days. Laura was about 630 miles sse of Cape Race Newfoundland at 5 pm ast. It continues north in the open Atlantic. NHC kept the top sustained winds at 60 mph. The convection has weakened somewhat and the last micowave estimate was 51 knots. This means that Laura is probably closer to 55 mph. 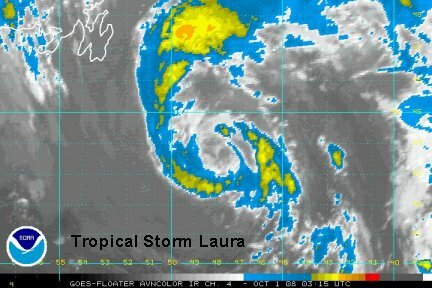 Laura will only be a bother to the shipping lanes of the North Atlantic ocean, and by the weekend affect the British Isles. Laura was centered near 39 N / 48.5 W or about 575 miles sse of Cape Race Newfoundland at 2:30 am edt. Top sustained winds are 60 mph. It looks like subtropical storm Laura has gained more organization again, so 60 mph is probably close. Laura is gaining more tropical characteristics so we expect that it will be changed from subtopical to tropical on Tuesday by NHC. No change in the forecast thinking. 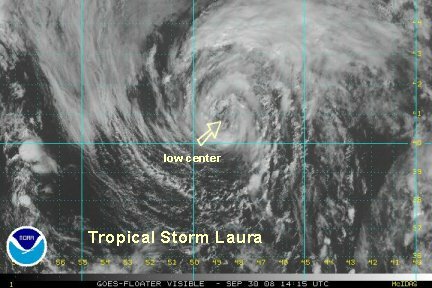 Laura should turn northeast soon and head toward the British Isles. 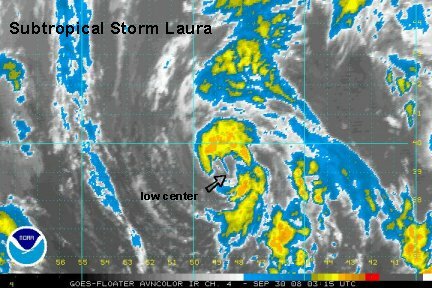 Convection has continued to build around the center of circulation and Laura has now officially been designated as a tropical storm. Top sustianed winds are still at 60 mph. Laura is centered 435 miles sse of Cape Race, Newfoundland and will continue north until Wednesday. It should then start turning more northeast as an upper trough starts to influence its steering motion. Laura will become extratropical by around the next 24 hours as it moves over colder water. It will then move south of Greenland, and Iceland on its way to the British Isles. 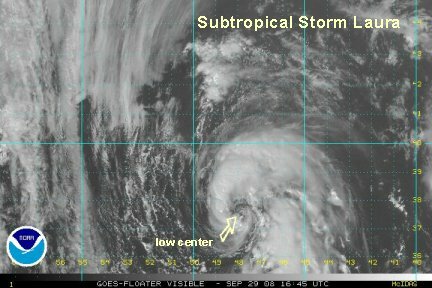 Tropical storm Laura is moving over cooler water and is becoming extratropical. The convection near the center is spreading out and looks more disorganized. With this happening, it resembles more a mid-latitude weather system now. 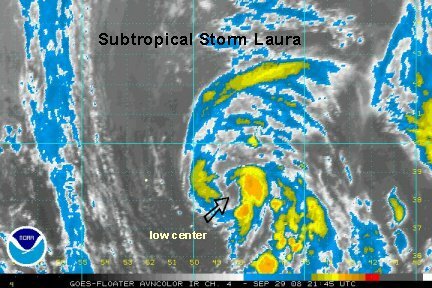 The National Hurricane Center should make Laura extratropical at the 5 am ast advisory. This will be our late update on Laura.